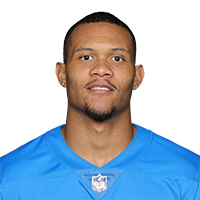 Golladay has moved up the Lions' depth chart at wide receiver following the trade of Golden Tate to the Eagles. 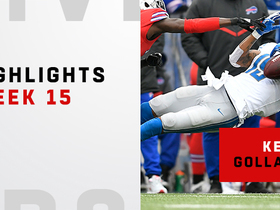 Analysis: Since the team's Week 6 bye, Golladay has been targeted just three times, catching all of them for 49 yards across two games. At the same time, Tate maintained his usual high volume with 18 targets. With Tate elsewhere in the NFC, Golladay and Marvin Jones will gobble up Tate's nearly 10 looks per game. This reality should help Golladay bounce back from his recent swoon, especially with a mark of 10.8 YPT for the second-year pro. Golladay secured his only target for 12 yards during Sunday's 28-14 loss to the Seahawks. 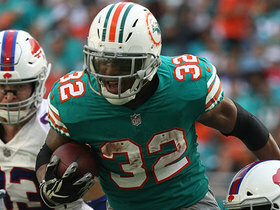 Golladay secured both of his targets for 37 yards during Sunday's 32-21 victory over the Dolphins. 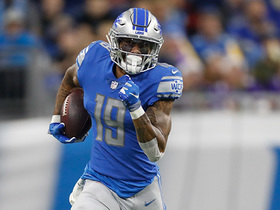 Golladay brought in four of nine targets for 98 yards and a touchdown in the Lions' 31-23 win over the Packers on Sunday. Golladay caught all four of his targets for 74 yards during Sunday's 26-24 loss to the Cowboys. Golladay secured six of seven targets for 53 yards and a touchdown during Sunday's 26-10 victory over the Patriots. Golladay secured six of nine targets for 89 yards and a touchdown during Sunday's 30-27 loss to the 49ers. Golladay caught seven of 12 targets for 114 yards in Monday night's 48-17 loss to the Jets. Golladay caught one of five targets for 36 yards in Friday's preseason win over the Buccaneers. Golladay got the start in Friday's preseason game against the Giants and caught two of three targets for 13 yards. Lions offensive coordinator Jim Bob Cooter said Golladay will be a big part of the passing game and has the ability to do special things, Tim Twentyman of the team's official website reports. Golladay brought in two of three passes for 80 yards and a touchdown during Sunday's 35-11 victory over Green Bay. Golladay caught four of eight targets for 29 yards during Sunday's 26-17 loss to the Bengals. 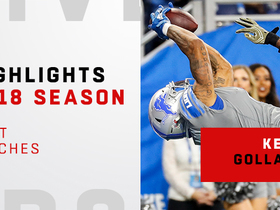 Analysis: Golladay saw the second-most snaps in the receiving corps (61 out of 64) -- behind Marvin Jones (64) and ahead of Golden Tate (52) -- for the third consecutive game. However, Tate is averaging 4.7 receptions for 44 yards on 6.7 targets per game over this stretch, compared to a 3.7/24.7/5.7 stat line for Golladay, which suggests the rookie remains No. 3 on the depth chart. 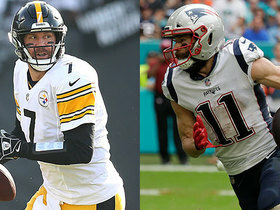 Both await a Week 17 matchup with a Packers defense that's allowed the sixth-most touchdowns to wideouts in 2017. Golladay caught four of five targets for 29 yards during Sunday's 20-10 victory over the Bears. Golladay brought in three of four targets for 17 yards while rushing once for nine yards during Sunday's 24-21 victory over Tampa Bay. Golladay secured two of three targets for 44 yards during Sunday's 44-20 loss to the Ravens. Golladay caught two passes on four targets for 61 yards during Thursday's 30-23 loss to the Vikings. Golladay caught two of three targets for 52 yards during Sunday's 27-24 victory over the Bears. Analysis: After logging just 11 snaps in his return to action last week, Golladay saw 35 out of a possible 63 on Sunday. Meanwhile, teammate and co-No. 3 receiver TJ Jones recorded 29 snaps. Although Jones actually saw more passes come his way, Golladay again showed he was the more dynamic option downfield by catching a 40-yard bomb in the second quarter. The rookie's 19.8 yards per reception now ranks near the top in the league among receivers who've seen at least 20 targets this season. Golladay played only 11 of 52 offensive snaps in Sunday's 38-24 win over the Browns. 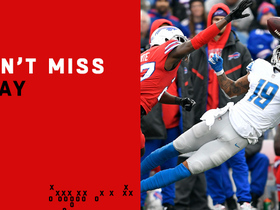 Analysis: It may have seemed like the rookie played more than 11 snaps in his return from a five-game absence, as he made the most of his limited opportunities with two catches for 64 yards on three targets. Marvin Jones (50 snaps), Golden Tate (36) and TJ Jones (29) all got far more playing time, and yet only Tate was more productive than the rookie. 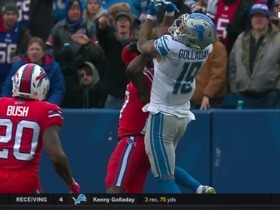 It seems inevitable that Golladay overtakes TJ Jones, possibly as soon as Week 11 in Chicago. Golladay secured two of three targets for 64 yards during Sunday's 38-24 victory over the Browns. Golladay (hamstring) is active for Sunday's contest against the Browns, Kyle Meinke of MLive.com reports. Analysis: Following another batch of limited practices, a cloud continued to hang over Golladay's potential to play for the first time since Week 3. 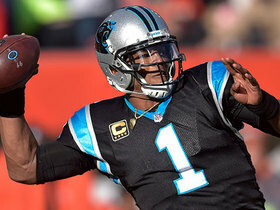 His participation in pregame warmups Sunday portended good things, and indeed he's making his return this weekend. The Lions have suffered mightily in the red zone this season, ranking 27th with a 45.8 TD percentage. Thus, Golladay could get in the act immediately when the offense approaches the goal line, among other areas of the field. Golladay (hamstring) remained limited at Friday's practice and is listed as questionable for Sunday's game against the Browns. Analysis: Golladay managed limited practices throughout the week but never quite made it back to full participation. While it won't be surprising if he misses another game, he's at least taken a clear step forward since last week when he managed just one limited practice and was listed as doubtful on the final injury report. With TJ Jones filling in more than capably as the No. 3 receiver, the Lions don't have much incentive to rush Golladay back for Sunday's 1:00 p.m. ET kickoff. Golladay (hamstring) was limited at practice Wednesday. Analysis: Golladay has now strung together two appearances at practice, albeit with a cap on his reps. The rookie wideout is seeking to put an end to a five-game absence, but merely staying on the field for practices this week would give Golladay a good chance to return. If he gets clearance before Sunday's matchup with the Browns, he'll have difficulty superseding either Golden Tate or Marvin Jones in terms of overall snap count, but Golladay's red-zone prowess could come into play almost immediately. Golladay (hamstring) took part in Wednesday's practice, Justin Rogers of The Detroit News reports. Analysis: On either side of Monday's win at Green Bay, Golladay has been a participant at practice. It's unknown if he'll replicate Saturday's limited showing, but the rookie wideout may finally be getting over the hamstring strain that has forced five consecutive absences to date. Golladay (hamstring) is listed as inactive Monday at Green Bay. Analysis: Golladay's journey through a hamstring strain included a setback immediately after the Lions returned from a Week 7 bye. With one limited practice both of the last two weeks, he didn't appear to be approaching a return until he was seen running routes with Lions receivers during pregame warmups, per Dave Birkett of the Detroit Free Press. 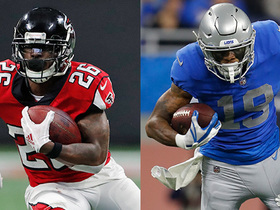 While Golladay progresses in his recovery, the wideout corps will be comprised of Golden Tate, Marvin Jones and TJ Jones. Golladay (hamstring) is doubtful for Monday's game against Green Bay. Analysis: The promising rookie was able to return to practice in a limited capacity Saturday, giving some hope that he might make his return in Week 10, but Monday's game against Green Bay is off the table. T.J. Jones will continue to function as the clear third receiver behind Golden Tate and Marvin Jones. Golladay (hamstring) participated in Saturday's practice and was seen "moving well during individual drills," Justin Rogers of The Detroit News reports. Analysis: After missing both Thursday and Friday's practices, Golladay seems to be making progress in his recovery. More word may emerge after the conclusion of Saturday's practice regarding his status for Monday against the Packers, though it seems safe to still consider him questionable for the time being. If he ends up being sidelined for Week 9, expect T.J. Jones to serve as the team's No. 3 receiver behind Golden Tate and Marvin Jones. Golladay (hamstring) wasn't present for practice Friday, Kyle Meinke of MLive.com reports. Analysis: The Lions will wait and see what Golladay is able to do in their final practice of the week Saturday before determining his status for Monday's game against the Packers, but it appears the rookie wideout is trending toward a fifth consecutive absence after recently aggravating a strained hamstring. Assuming Golladay sits out the Week 9 matchup, TJ Jones will be in line to serve as the Lions' No. 3 receiver behind Golden Tate and Marvin Jones. Golladay (hamstring) didn't practice Thursday, Justin Rogers of The Detroit News reports.